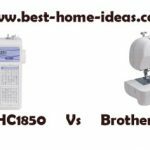 Brother HC1850 Vs Brother CS6000i comparison becomes valid only when there is a huge price drop for HC1850. Otherwise this comparison is meaningless. This comparison becomes valid only during the shopping season. The reason I am saying this is because you will see a huge price drop for Brother HC1850 during that time. The drop in price gets HC1850 in the price range of CS6000i, the price of CS6000i stays more or less stable even during the shopping season. So this makes people compare Brother HC1850 with CS6000i. For the rest of the year, CS6000i is always the least expensive sewing machine. When you compare HC1850 and CS6000i, you will see that both these machines are poles apart in features. There is no question about which one is more advanced. Feature wise, HC1850 is way ahead of CS6000i. But CS6000i has been the best seller for more that 5 years now. The inconsistent price of HC1850 has slowed down its progress quite a bit (sometimes the price is too high and sometimes it’s an absolute steal). So always compare the price before you buy. 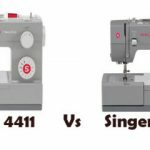 Both are computerized sewing machines but slightly different in design. 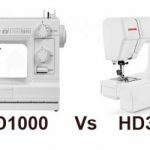 HC1850 is more of a rectangular type machine, whereas CS6000i has more curves on it. Looks really doesn’t matter much, it is the performance and features that matter. So let us have a look at that. 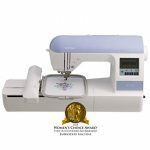 Built-in Stitches : Brother HC1850 is the clear winner with 130 built-in stitches which includes 8 one-step buttonholes. Brother CS6000i comes with only 60 built-in stitches including 7 one-step buttonholes. Monogramming Font : Another point for HC1850 as it comes with a sewing font for basic monogramming. The font is not perfect for lightweight fabrics though it works well on heavy fabrics. CS6000i doesn’t have a monogramming font. Machine Weight : HC1850 is just .2 pounds heavier. You won’t even feel the difference. Hard Cover : Brother CS6000i comes with a hard cover. Hard cover doesn’t always come included with HC1850, please check before purchasing. Above said are the areas where these two machines differ. All other features are the same. Below table shows all the features as a whole. The difference is marked out in red for your convenience. Performance wise, you can’t really tell the difference between the two. 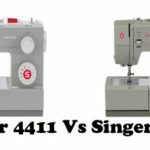 Stitch quality of both machines are excellent across different types of fabrics. HC1850 will suit intermediate and advanced sewers as it comes with a lot of stitches and font for monogramming. I feel beginners can be 100% satisfied with CS6000i and its features. CS6000i is an outstanding performer in the beginners category, that is the reason why it features in our list of ‘Machines You Can Buy With Your Eyes Shut’. The choice comes down to the price. You need to consider the extra features you get with HC1850 and add the price of a hard cover to that. To me, HC1850 will be a good deal if it costs only $30-$40 more than CS6000i. Anything over that, I will go with CS6000i. I have seen the price difference as low as under $10, so keep an eye on the price, you might get lucky.